NEWS FLASH: Jason's Book Now Available! 快訊:《香港情懷》現已出版! 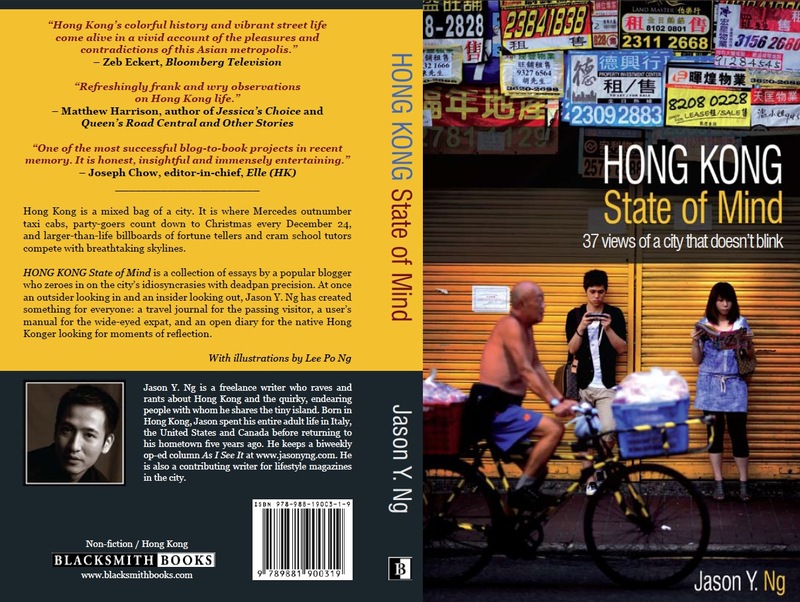 My new book HONG KONG State of Mind is available in Hong Kong at fine bookstores across the city. 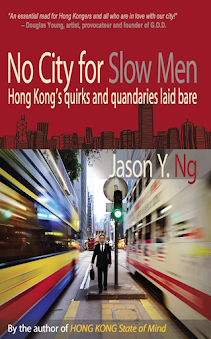 Readers outside Hong Kong can order it from www.amazon.com or www.blacksmithbooks.com. Support a local writer and purchase a copy today! HONG KONG State of Mind is a collection of essays by Jason Y. Ng, a popular local blogger, who zeroes in on the city’s idiosyncrasies with deadpan precision. The 37 essays are organized into three thematic sections: people we see, things we do and places we go, each providing a window on Hong Kong’s city life. Ng’s topics range from the shark fins debate to our unique and unmistakably Cantonese coffee-drinking culture. While the book is meant to pay tribute to Hong Kong’s many quirks, it also puts her flaws on center stage. In “Rhapsody on Pedder,” the author juxtaposes his fellow citizens’ sense of alienation and vulnerability against their unbridled materialism. In “Total Eclipse of the Mind,” he puts our pervasive superstitious beliefs on trial using a series of unrelated news events. In “A Tale of Three Cities,” he compares the coming-of-age stories of Hong Kong and its sister cities Macau and Shenzhen and prompts us to reflect on who we are and where we are heading. At once an outsider looking in and an insider looking out, Ng has created something for everyone: a travel journal for the passing visitor, a user’s manual for the wide-eyed expat, and an open diary for the native Hong Konger looking for moments of reflection. The author’s no-nonsense style, punctuated with wry humor, cuts through the obfuscation and gives the reader the kind of social commentary that recalls F. Scott Fitzgerald during America’s Jazz Age. Each essay is graced with a line drawing by Lee Po Ng, the author’s father, which lends the book a personal touch and the aura of an old-fashioned travel journal. The official book launch, organized jointly by Bookazine Ltd. and Blacksmith Books was held on 5 March 2011 at Bookazine’s new location at the IFC Mall. Jason Y. Ng is a globe-trotter who spent years in Europe and various cities in the United States and Canada before settling back in his birthplace five years ago. He is a full-time lawyer and a contributing writer for lifestyle magazines. In 2008, Ng started his blog, As I See It, commenting on local culture and news events. Over a short span of time, the blog has attracted a sizable following of online readers. 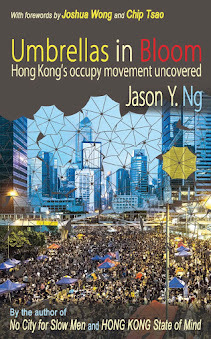 Ng lives in Hong Kong and can be contacted at info@jasonyng.com.